So, recently I was introduced to www.PowerElectronicsNews.com by SixtySecondTech, a website which aims to become somewhat of a "website directory that lists quality websites they find valuable and resourceful for the Technology community" (source). As SixtySecondTech grows their database, I hope they can become a good resource to the electronics, maker, Arduino, Raspberry Pi, and other communities. PowerElectronicsNews is a brand new company who offers "electrical engineering news focused on power and power solutions," including highlighting "solutions and products featuring the latest innovations" in power design. As I continue to grow my skills I hope to be able to apply some of the background knowledge I glean from their articles, so I can use it in real, hands-on projects I can then share and apply instead of just reading a high-level description of it. A few interesting-looking articles of theirs include the following. I have marked with asterisks the articles that particularly interest me. The more asterisks, the better. One of their categories particularly interesting to me is their "Batteries" section (http://www.powerelectronicsnews.com/category/batteries). Be sure to click "View More" at the bottom of their category links which are found as tabs at the top of their page. If you read my articles about parallel charging LiPos or restoring over-discharged LiPos, you'll see batteries is one area I find worth-while studying about, as it applies to just about every electronic or robotic device in the world. In Arduino projects, LEDs are *very* commonly used, so the LED driver selection article above looks interesting to me too. 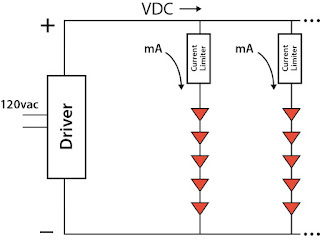 One important thing to note, as the image below (from that article) shows, is that each parallel string of LEDs *must* have its own current limiter in series. Otherwise, one string of LEDs will receive more current than another, until it eventually burns up. Once it burns up, it's a cascading effect: the remaining strands have more current to bear, so they burn up too. Many cheap Chinese flashlights and LED-based devices are poorly designed and don't have a proper current limiter in series with each parallel string, and the LEDs burn up way before they should. Don't make that mistake. You can NOT just have a single current limiter in series with a bunch of LED stands in parallel. Again, each strand in parallel needs its *own* current limiter, so that all the current limiters are paralleled too, thereby properly sharing the load between the different strings. 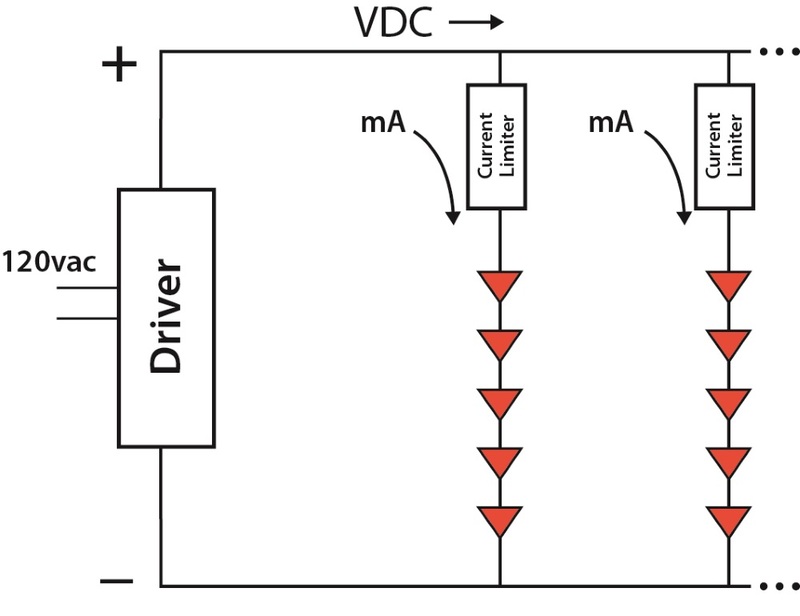 Note that the most common current limiter is a simple resistor, but I recently learned how to make a passive (ie: not microcontroller-based) feed-back-based current limiter using an N-Channel depletion-mode MOSFET. I hope to share that with you sometime. Anyway, happy reading and go build something! As Destin says (from my quotes at the right-hand side of my website), be a thinker *and* be a doer...not just one or the other.